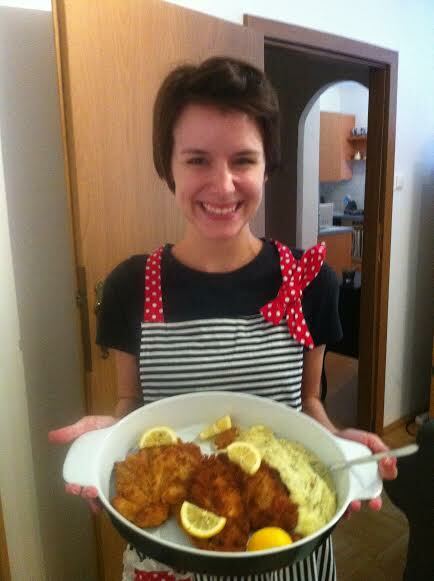 The very first time I made Schnitzel. Nothing has made me swell with pride or turned my face an embarrassing shade of red like the expat life I lead in Austria. Just today I had the 5th or 6th humiliating experience of not understanding how a restaurant’s bathroom sink worked, and in that moment it occurred to me that this happens to me way too often, and I couldn’t help but bust out laughing – by myself – in the restaurant bathroom. (I did eventually wash my hands in said bathroom.) Being an expat has provided me with the ability to just laugh at myself when I fail at figuring out a sink or butcher every sentence I attempt to say in German. But because I’ve discovered this ability to laugh when I fail, it makes my successes that much sweeter. Once, my husband made me – nay, FORCED me – to go to the Apotheke (pharmacy) by myself to retrieve a receipt I had forgotten to get. I was terrified and had zero faith in my German pharmacy-speak. I nervously prayed the whole, slow walk there for strength and for me to not faint at the counter from fright. But I shouldn’t have been so scared. I spoke to “Herr Doktor” and explained the mix-up from the week before, and he understood me and I got my receipt. I was so happy that I ran the entire way back home and cry-laughed while I told Will how it went. When I compare my success and failure stories to ones I’ve experienced in the States, I see how way-too-seriously I took myself over there. And I can further appreciate how my expat life has pushed me out of my comfort zone, torn down my barriers and taught me to laugh. 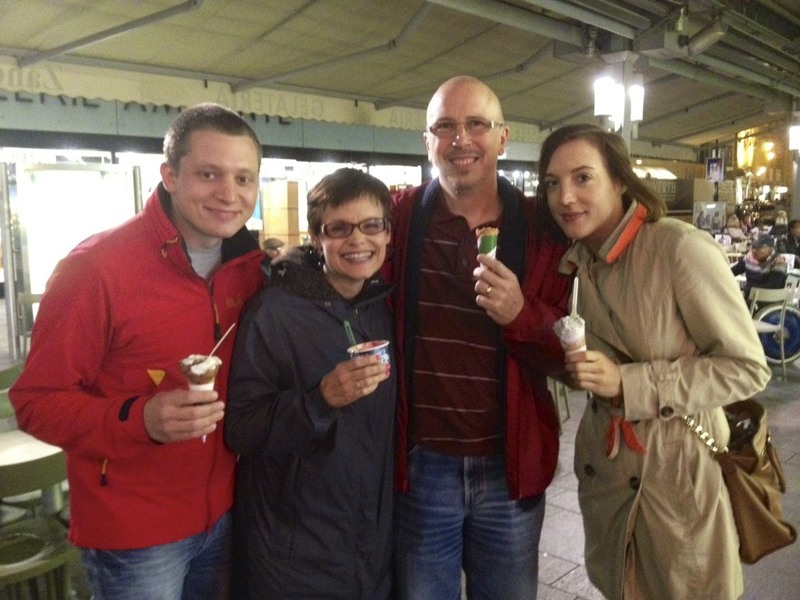 My US family with my Vienna family! My biggest fear in moving to Austria was that I would make no friends. I’d arrive, appear strange, scare people off with my loud voice and immediate hugging reflex, and be friendless forever. And that is not the case. I don’t mean that to say I have one thousand and one friends because Austria was so drawn to my loudness and hugs, I just mean – I have found a family here made up of the most amazing, caring and loving people. They took me in, weirdo and all, and helped me feel at home in a place where I was originally afraid would never feel like home to me. On the flip-side, I’ve experienced the fear of not feeling connected to my original family in the States, yet that too has not been an issue. We stay connected and go about it with great purpose. Seeing my friends’ and family’s faces on Skype always makes my day, and having the chance to embrace them is all the more exciting. And because of these two families, I have two places to call home on both sides of the ocean. 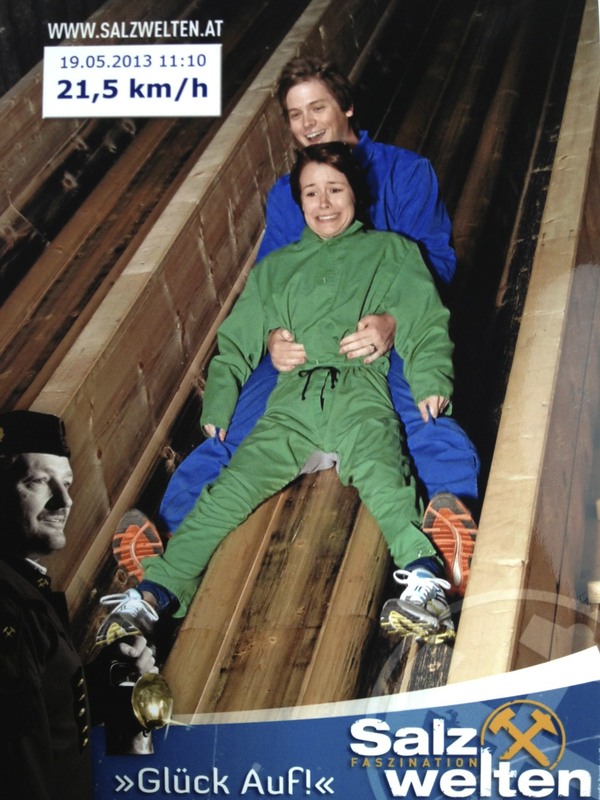 Sometimes trying something new is scary, like slides in a salt mine. The expat life almost requires this healthy balance and it takes a while to develop. One can either jump right into a new cultural experience too quickly and do some damage, or one can overthink an experience and miss out on it entirely. A very light example of acting too quickly is actually my one of my top pet peeves of people who visit Vienna, and that is when they TALK SO LOUDLY EVERYWHERE THEY GO AND YOU CAN HEAR EVERY WORD THEY’RE SAYING LIKE HOW GOOD THAT WEENER SCHNITZEL THING WAS. Yikes. One way to not make any new acquaintances around here is by doing just that; that’s why I learned very quickly to study my surroundings first, then act. And also not saying “that Weener Schnitzel thing”. So if no one on the U-Bahn is speaking, I don’t speak. If everyone is speaking in a gentle low voice, I speak in a gentle low voice. My expat life has made me a student of my surroundings in order to not offend or attract attention to myself (unless I can’t figure out another bathroom sink). But my expat life has also made me jump in the water without testing it first, like eating Leberkäse (literally translates to Liver cheese and not my favorite dish) with everyone else or playing the German version of Taboo and failing miserably at describing “Taschenhund” to your Austrian teammates. Sometimes this life requires you to just do and see what happens, though I can promise I will always think too long about and definitely miss out on eating blood sausage. Can’t do it. 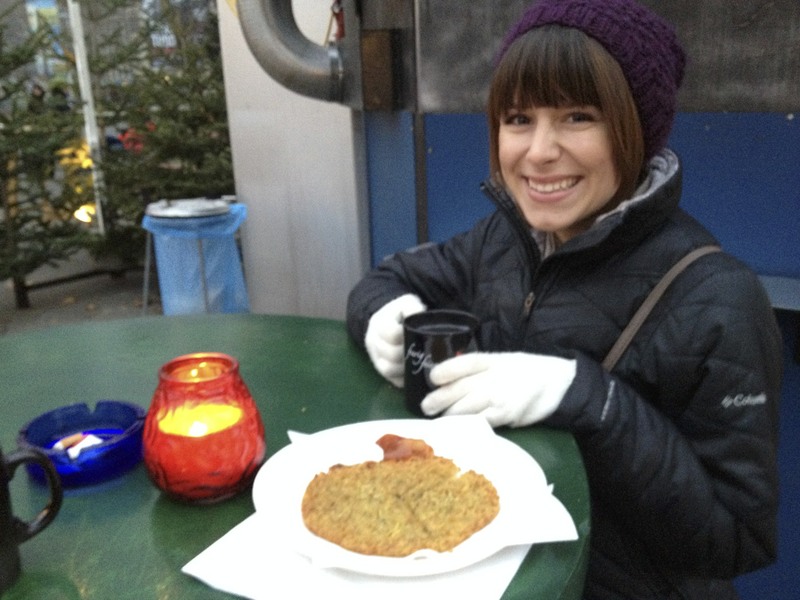 Trying out yum food at a Christmas market. Before moving here, my husband and I trained for close to a year with two families who had prior experience in living abroad. We were told about people who move to other countries and essentially wind up creating a mini version of the US with other American families within their new city of residence out of fear for the unknown. Their children go to English-speaking schools, the families visit English-speaking doctors, they hang out with English-speaking people. They do what’s familiar and only that – an easy temptation to give into and empathize with. While I definitely have days where I wish the US would just arrive at my front doorstep, mainly for Chik-fil-a and burger reasons, my husband and I have never been drawn to a mini United States of America. We try to love and appreciate every new thing we encounter, like the beauty of the German language or how everyone and their dog goes outside the second it’s warm enough. The expat life is meant to be lived, not kept in a snow globe of familiarity. 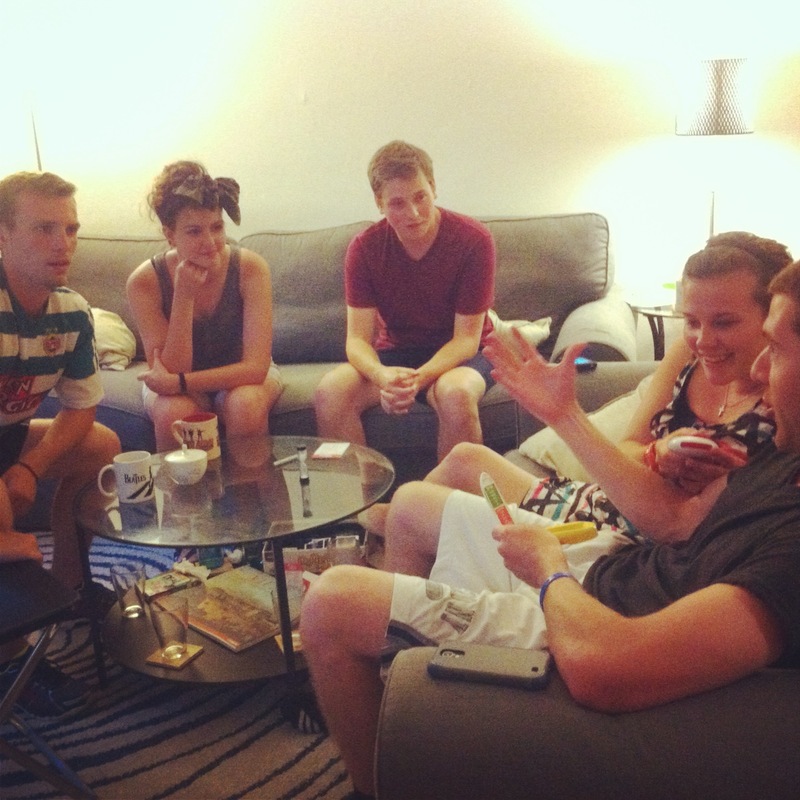 Past study abroad students who made me cry often because of their Vienna love. I think my expat life has permanent control of my tear ducts because I’m seriously emotionally overwhelmed by everything culturally beautiful. Sometimes I see an elderly woman or man out and about, trucking along with their Nordic walking sticks like it ain’t no thang, and all of a sudden I’m teary-eyed while inwardly cheering them on as they proudly extend their number of years left on this planet. Or the students! They get me every time. My husband and I have the opportunity each year to interact with different groups of American study abroad students and we get to observe them fall in love with the city. This turns me into mush. As of late the current group has been making numerous videos of their experiences from Vienna and I can’t handle them. They’re too wonderful. I think a switch turns on after you’ve lived abroad for awhile – a switch that not only allows you to be moved by your own cultural findings and experiences, but allows you to be just as moved or even more so by others who go through and discover parts of countries and cultures that you too have experienced. So make sure you have tissues on you at all times. Hi Meghan! Thanks for stopping by. I’ve seen your blog before and love reading it. I’m not sure how many mini-Americas are in Vienna, but I know of a couple sections of the city where I feel like only English is spoken, mainly around the UN which makes sense I suppose. We knew before we came here that that sort of life abroad didn’t appeal to us, and it’s stayed that way ever since we moved here. We try to conduct every aspect of our life in German, including doctor visits, phone calls, etc. I really like what you said about doing things the “British way”! I love that and can relate as I try to do things the Austrian way, and like you, am sometimes not so successful, but at least we’re giving it our best. Thanks for saying hello! Hi Holly, these are great things to love about expat life and so much that I indentify with. Having moved from London to France it’s been so easy to get caught up in the mini England that is all around us, but for us moving here was about becoming part of the French community, especially as we have kids. There’s so much that I do day-to-day that takes me out of my comfort zone but everything I do gives me a bit more confidence. Leaving family back in the UK was hard but we’ve made so many like minded new friends who are quickly becoming our extended family. Thanks for sharing and I’m looking forward to reading more of your blog! Thank you Amanda for this link-up! So glad I stumbled upon it. I loved reading your 5 things and could identify with several. I too am looking forward to reading more about your expat experiences.